Super Chunky Grain-free Chocolate Chip Granola made with all vegan and gluten-free ingredients for an easy and healthy nut-based granola recipe! I’m the annoying person who opens a bag of granola and picks out every single cluster then eats the rest of the crumbs afterwards. I live for granola clusters. They’re my favorite snack (dipped in nut butter) and every time I need a little nosh or something crunchy to snack on, I pull out a bag of granola and go to town. The granola love affair likely isn’t coming as a surprise to you guys as you see me post on Instagram daily about ‘nola. Whether that’s sprinkling it on my breakfast or dessert bowls or just snacking on it during the day, it is my go-to always. Ever since Quaker was one of the only brands making granola. I used to snack on that one constantly and in the dining hall in college, they had a huge tub of it and I would always get some to go in a coffee cup (I’m crazy, I know). I’m not biased when it comes to grain-based or grain-free granolas. I usually spice things up a bit and mix them together in fact. My fridge constantly has a few bags opened. You may be wondering why the heck I store granola in the fridge and it is to make it extra crunchy! I find some brand’s granolas tend to get soggy if not. I do buy granolas more than make them (guilty since it is easier), but I do love making some homemade clusters when I can. And now I finally have a homemade GRAIN-FREE granola recipe to share with you! The number one most requested recipe is finally here. 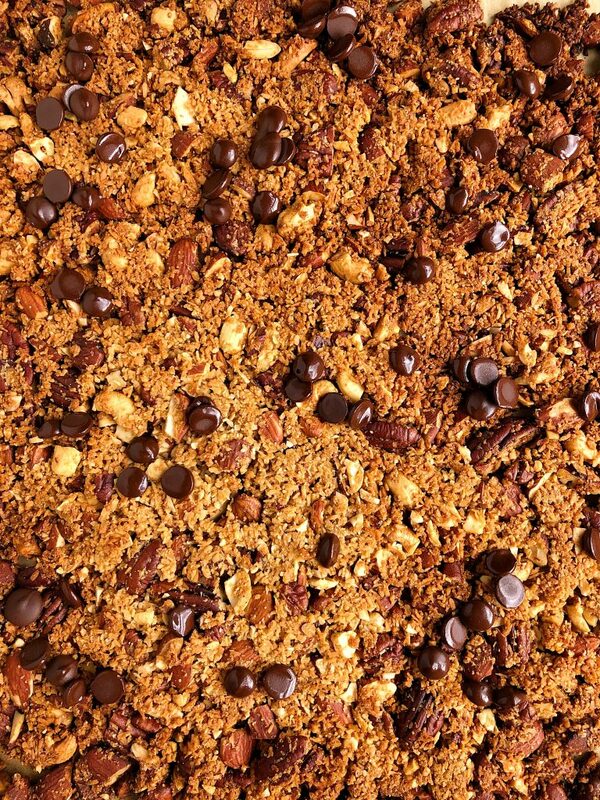 This Super Chunky Grain-free Chocolate Chip Granola is going to be your new BFF, I can promise you that. It bakes in one big mama cluster and then you break it up into smaller pieces. This recipe is so easy to make and it is even plant-based and relatively lower in sugar compared to most granolas in the store. I use a base of raw nuts, coconut flakes and seeds and sweeten it with a little maple syrup and of course the dark chocolate chips. 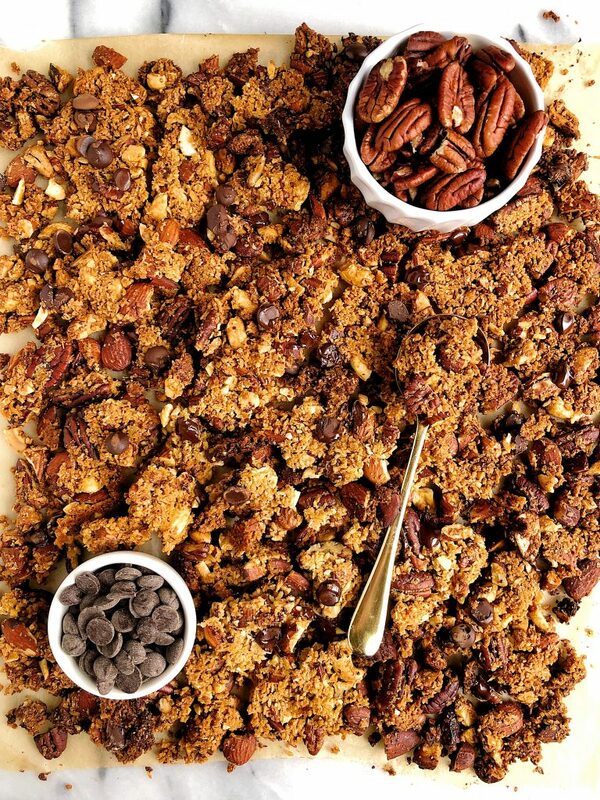 Enjoy Life Food’s Dark Chocolate Morsels are the ultimate melty chocolate chip to add to this granola. As you know, their baking chocolates are a staple over here in my kitchen. I love using them in desserts, breakfasts, snacks, anything. Plus they are free of all the top allergens. You likely have seen Enjoy Life Food’s products in most grocery stores and they were the first healthier chocolate chip I ever purchased and actually enjoyed. They’re not too sweet (especially the semi-sweet ones) and add the most perfect sweet crunch to this clustery grain-free granola recipe! 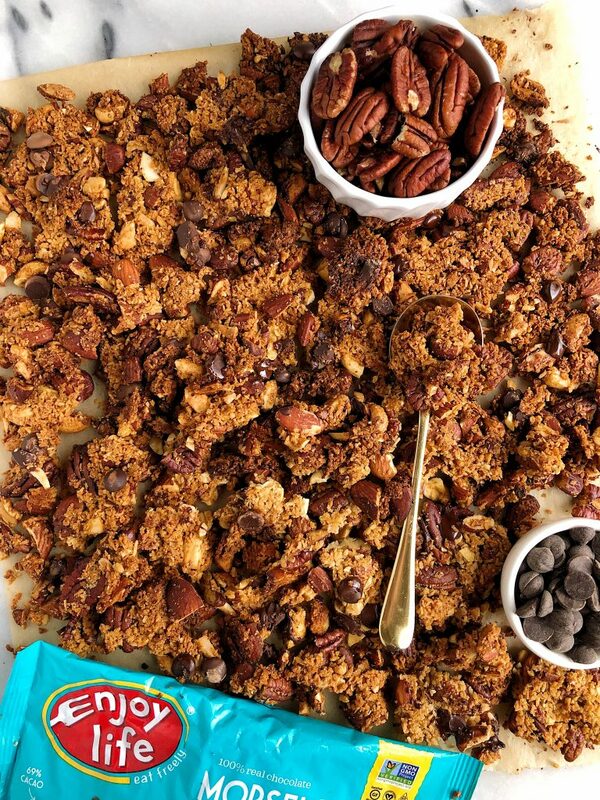 If you make this Super Chunky Grain-free Chocolate Chip Granola at home, don’t forget to tag me on instagram. I hope you guys LOVE! Break the large cluster into smaller pieces and enjoy! Thank you Enjoy Life Foods for sponsoring this blog post! Omg you are just killing it over here. You did not even skip a beat being a new mommy and all! This looks delicious can’t wait to try it!! This is the BEST granola that I have ever made or eaten. So easy to put together, so crunchy and clustery, and the most delicious flavor! I am amazed by how perfect this is — make this now!! AWWW! so happy you love! I dislike coconut, any recommendations on a substitution for the coconut flakes? Thank you. maybe some raw nuts or seeds of choice? anything can work!